In this article, we will show you how to make an applet(running in a webpage) open a new webpage in the new tab of the browser. This will be accomplished by showDocument() method of AppletContext interface. AppletContext interface gives us the access to the environment in which an applet is running and through this enviroment we can open a new webpage in the web browser. _blank, opens the new webpage in a new tab of web browser. _self, opens the new webpage in the current tab of web browser that contains the running applet. 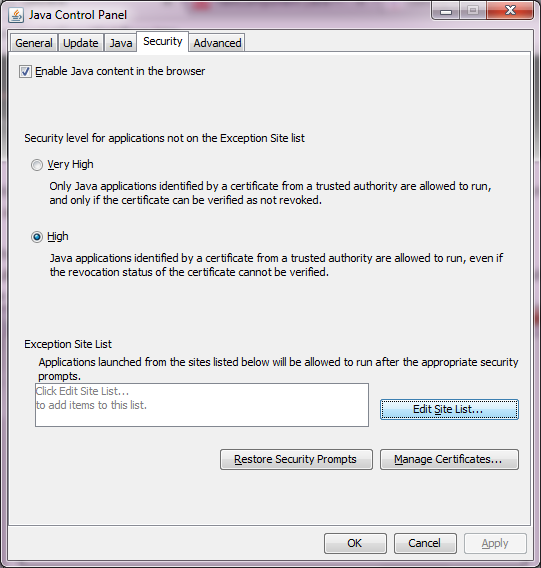 Due to new security restrictions imposed by many browsers, applets aren't allowed to run in Google Chrome, Mozilla Firefox, though we can still run applets within a webpage in Internet Explorer but only after making certain changes in the configuration of Java on our system. 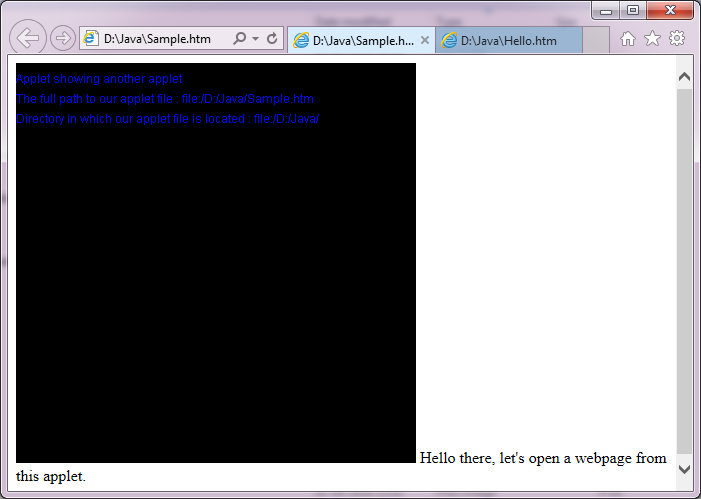 So, this example is based on opening an applet in a webpage within the Internet Explorer browser. Points to remember before running an applet from within a webpage. Both webpage and the applet code must be in the same folder. 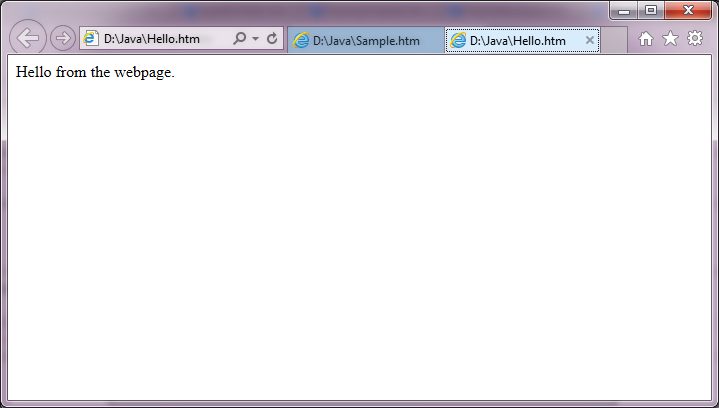 In our example, both the webpage - Sample.htm and the applet - Applet15.java byteclass file Applet15.class are within the same D:/Java folder. Hello there, let's open another webpage from this applet. How to run applet - Applet15 from within the webpage - Sample.htm? 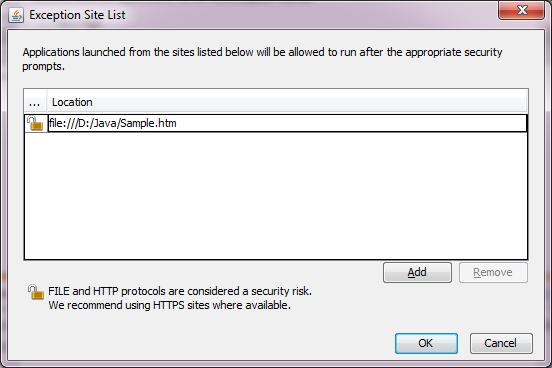 In the Security tab click on button Edit Site List to add the full path of to Sample.htm webpage file to the exception list in "Configure Java" settings, this will allow Sample.htm webpage to run the applet(Applet15) mentioned in it, in the Internet Explorer browser. 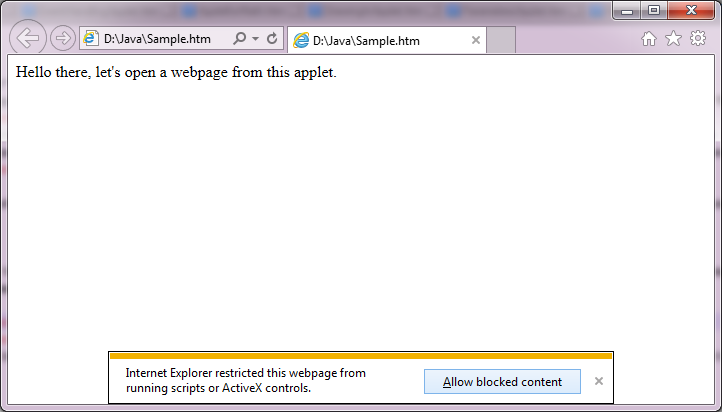 As soon as you click on the button "Allow blocked content", your applet contained in Sample.htm opens up and it also opens up another webpage Hello.htm in a new blank tab of browser.